One of the most frequent targets of rockets fired from Gaza during the current military violence, aka Protective Edge, is the Israeli town of Ashkelon. Ashkelon is on the Mediterranean coast, about 13 km or 8 miles north of Gaza, so its 117,000 inhabitants have only 20 – 30 seconds to reach cover once a Code Red alert sounds. Not surprisingly, they are fed up with living that way, and before the Israeli ground offensive began some of them wanted it to happen, while others disagreed. On the street, according to this Jerusalem Post report, there was a feeling that the government needed to get tough – we need a Putin, they said. Be careful what you wish for. When the situation is presented this way: “we just want to live here peacefully, but the Hamas terrorists keep attacking us,” it make sense to limit the discussion to the extent of the measures that self-defence should take. Of course, air shelters and the Iron Dome rocket defence system, but to really stop the rockets, just air strikes or also a ground invasion? Just to weaken Hamas, or wipe them out? The context calls for some other questions, both about what self-defence means, and what the situation really is. Here I won’t try to provide a whole context or history, merely to point out that Ashkelon was not always Ashkelon. It has been inhabited since long before Jews and Arabs arrived in the land, but from the 16th century until 1948, it was the Palestinian Arab village of al-Majdal, with about 11,000 residents. According to the 1947 partition plan, it was to become part of the Palestinian Arab state. During the 1948 war, most of the inhabitants fled as it became the forward position of the Egyptian army, and so a target for Israeli attacks, and as a result most of the inhabitants fled further south to Gaza. When Israeli forces took the town in November 1948, there were only 1,000 people left. At first, they seemed to be luckier than the 700,000 or so Palestinians who became refugees, as local Israeli officers ignored an order by their commander Yigal Allon to expel them. In fact, their numbers increased to 2,500 as other Palestinians who had been uprooted from the surrounding area either sought a relative haven with them or were sent from other places from which they had been expelled. But they were kept in a barbed wire ringed camp known as the ghetto (yes, really) and dispossessed of their homes and livelihoods. Generally it’s claimed that the exodus of Palestinian refugees was an immediate result of the war and the fighting, or a military necessity for the fledgling Israeli army fighting the armies of the surrounding Arab states. But the refugee crisis was really created after the war had ended, both by preventing the return of the civilians who had fled their homes and by expelling more of them. Not only were the 10,000 residents of al-Majdal who left the arena of battle in 1948 not allowed to return, but the 2,500 Palestinians who remained there after the war had ended were expelled. There was actually some discussion in the Israeli government about what to do with them, so there was no rushed response to an emergency situation, but a policy decision was made that they had to go either by choice or by force. The “voluntary evacuation” was a sham, the main point of which was to get those who left to sign papers relinquishing all future claims to return. On 17th August 1950 the expulsion began, with almost all of them going to Gaza. 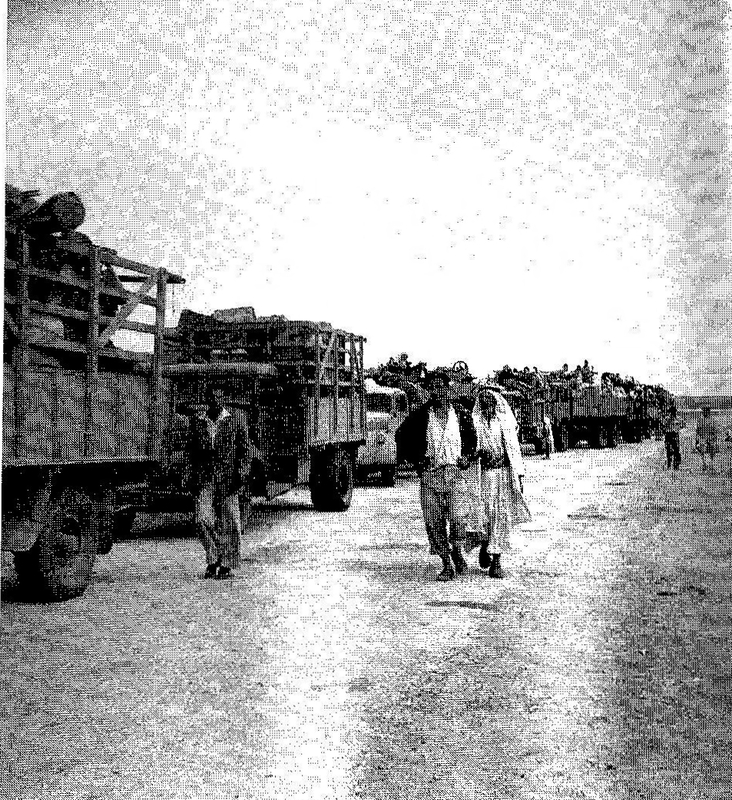 The expulsion is documented in Israeli records, including photographs of Palestinians loaded onto trucks. Al Majdal, October 12th 1950. Photo by Beno Rothenberg. So if we know and understand that most of the Palestinians in Gaza are refugees and their descendants, mostly from the areas where Israeli civilians are under rocket attack, how else might we think about “what must be done” now? If we perceive the horrendous situation not simply as something that began when Hamas took over Gaza in 2007, but as a violent reality that has existed since 1948, what would it take to address the issues feeding into the current violence? So, what would self-defence look like if Palestinian refugees living in Gaza returned to Ashkelon, a growing city? Would we need an Iron Dome or air shelters? Who would be firing rockets, and at whom? Would “we” need a huge military budget to defend ourselves from “them” if all of us lived not in zones defined by barbed wire and concrete walls, but by the myriad connections of Jewish-Arab, Palestinian-Israeli civil society – neighbourhoods, schools, transport, trade, culture, language, government? What do we prefer, to protect ourselves from the rockets at the cost of many more lives, or to live with the refugees? This entry was posted in anti-war and tagged al-Majdal, Ashkelon, Gaza, Hamas, Israel/Palestine, Israeli peace activism, operation protective edge, Yigal Allon, Zochrot on July 28, 2014 by Jon Simons. I think these are the important questions and framing things in this way may poses the question and may open minds and modes of thought that offer some answers. Do you believe any longer in a two state solution or is a one state shared by all solution the most viable? Is a modern state of Israel a mixed secular state based not on ethnic/religious lines but a shared invigorated consensus between peoples of all extraction? Who knows what can emerge from this and so many other dialogues but it is here in my view that hope lies… and despite the tremendous fear and resentment on the ground, on both sides, this is what offers a possible path out of both. I think that however many states there might be, and however imaginative the constitutional arrangements would have to be to foster peace, thee won’t and can’t be a just peace unless it addresses the refugees, and unless it rebuilds the Arab-Jewish civil society that was destroyed in 1948.